Political gladiators in the ruling All Progressive Party, APC, kicking over a possible endorsement of President Muhammadu Buhari by the party as its presidential candidate for the 2019 polls have been asked to calm their nerves. Nasarawa State Governor, Alhaji Umaru Tanko Al-makura says Buhari would not cherish being given an automatic ticket and won’t accept such offer. 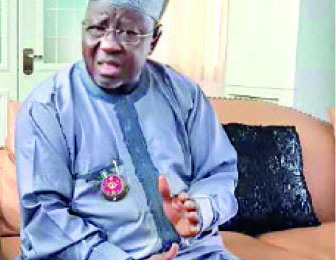 Al-Makura, a close associate of the president who emerged governor on the platform of the defunct Congress for Progressive Change (CPC) in the 2011 general election, asserted that Buhari wants to slug it out with other contenders for the party’s ticket at the primaries ahead of 2019. In this exclusive interview, he spoke on a wide range of issues including his stewardship in Nasarawa State; his vanguard for a national legislation to cater for people living with disabilities; perennial clashes between farmers and herdsmen, the challenges confronting Buhari’s government and agitations for self-determination in some parts of the country. He insists that Buhari has done well in the past two and a half years and should be appreciated by Nigerians. You have been on the saddle for the past six years. How has it been governing Nasarawa State? I will like to give the grace to the Almighty God for giving me the opportunity to be on such a very exalted saddle of governing Nasarawa State in the past six and a half years. I must confess that it is not all bird of roses; it is also not the best job to do considering the challenges one would have to face. However, it is also a most rewarding responsibility because one has come and seen the kind of challenges people are facing and one plans studiously how to accomplish those challenges to give relief to the people of the state and at the same time the background that would be the foundation or fulcrum for effective and progressive development. So in a nutshell, would say my experience in Nasarawa State has been very rewarding, very challenging and to a large extent, I can say it’s been very successful given those tasks I have been able to accomplish that has offered so much relief, so much value to the quality of life of the people of Nasarawa State, especially the common man; the vulnerable ones and those that unless one comes to them. Did you plan to be governor of Nasarawa State? Was it a dream come true or an accident of fate? Thank you very much. To me, this is a very pertinent question. As far as my aspiration and ascension to the governorship of Nasarawa State is concerned, it was never by accident. It has never been a dream; it has been a painstaking programme, a painstaking aspiration to have the opportunity to be in the saddle of governorship of Nasarawa State, so as to first of all correct some of the imbalances. When I say imbalances, I am not talking about one side of the state against another tribe, or against one religion, no. The imbalance between the well to do and those that are not well to do. That is one of my preoccupations; to see how I can uplift those people that are completely down because they could not determine their fate. Let the government do it for them. Secondly, to also create an avenue through which every indigene of Nasarawa State could feel a sense of worth, a sense of participation, a sense of democracy, and also provide a foundation that could be the cornerstone for effective development; a cornerstone for fast-tracking or increasing the speed to accomplish certain things that would be for the benefit of the people of Nasarawa State. So as a matter of fact, my coming into office as governor of Nasarawa State is something that was carefully planned with an objective focused to do those things I have just mentioned. In attempting to correct the perceived imbalances, what specifically did you set out to achieve as governor of Nasarawa State? All that have to do with social justice; to ensure that every category of the citizenry in the state gets what is due to them. Those between the middle and the low, to see how government relates to each and every one as a government that is responsible to ensure it promotes hope, it promotes a kind of optimism in the minds of the people so that they can faithfully partake in governance. When I came on board, in my first year, I tried to sensitize people; changing the mindset, the psyche of the general populace not to see government as a different entity from what they are. I tried to inculcate in them the feeling that government belongs to all of us and whether you are formally engaged in the activities of government or you are a private entrepreneur or a farmer, or even an employee, you have a stake in government and there is a role you could play no matter how little, that will advance the course of governance. I was very lucky to have a well motivated citizenry and they bought the idea. That, to me, became an impetus to dare anything that I dream will bring benefits and progress to the people of Nasarawa State, I could be assured of peoples’ support and encouragement. So, these are the kind of things I decided to do at the beginning and it set the programme, the standard for peoples’ participation. This culminated in a more focused and committed programme. With this, I discovered that the greatest need, the greatest challenge facing the state after sensitizing them, is to ensure physical development of the state. I started with physical planning and physical infrastructure, because when I came on board in 2011, apart from the federal road that traversed the state from Jos to Makurdi, and from Lafia to Shendam, there hadn’t been a single kilometre of asphalt road built by any government in the state before my coming. So I saw physical infrastructure as a very critical necessity that the people needed at that point in time if we will have some development because without physical development, nothing could be done because Nasarawa State being a new state, some of these roads, bridges, and other social infrastructure were unavailable. So the onus was on me to provide very basic infrastructure that will provide the state the platform to accelerate its development. I was very lucky to have gotten a team that internalized this concept and with the little resources available at our disposal, we ensured accountability, prudence and a maintenance culture which has helped to make us maximize the utilization of the little resources that we have, and I am happy to say that today, Nasarawa State is a completely new state from the one I inherited in 2011. Nasarawa is a typically agrarian state. How did you get the funds to embark on massive infrastructural development? As I said earlier, three things are going well for me. One, with the sensitization and inculcation of value orientation, I have been able to restore peoples’ confidence in government. So that gave me a ready and waiting citizenry that were ready to support the government. Secondly, we tried to be prudent and accountable. The business as usual for sharing money to people that called themselves special elites became a thing of the past. When I came on board, I did not go that way. I was concerned about people with values; I was concerned about people with capacity, I was concerned about people with industry that can come together and join hands to provide something for the people of Nasarawa State. How I was able to do it was, apart from all these, was to ensure that we carefully assessed and conceived projects that first of all, is a necessity for the people. Secondly, projects that we will be capable of accomplishing. Thirdly, to also ensure that the cost of such projects are the minimum available anywhere. It will surprise you to know that if I had gone the way my predecessors went, we wouldn’t have been able to accomplish the projects we did within this period of time, given the way government business was being carried out. Coming from a private sector, I ensured that for every project I intend to embark on, I will do some kind of market survey to ensure that we get the least cost and with high standard. One example I can show you is, a kilometre of road in Nasarawa State we constructed was just about N250million; asphalt road, double drains. This may not be true with many, many states in the federation. That was one of the reasons why we were able to accomplish tremendous amount of work with little resources. I learnt the Federal Government recently indicated interest to adopt a model primary health programme initiated by your government. What is it about and what informed the idea? I think the reason first and foremost, is the kind of manifesto APC has prepared and the kind of programme of execution of the manifesto by my administration since I came in 2011. As regards the health sector, we have what we call the pyramid structure. At the base, we have the primary health care centres and as you go up to the apex of the structure, you have the teaching hospitals, the specialist hospitals. The most needed, the most critical are those at the base because that is what will provide the general populace an easy reach for medical care. We realized over time that the primary health care activities are the most important and rewarding of all health activities because at that point, you will be able to arrest and stop health challenges at their early stage before they become compounded. So a wise government will invest more on primary health care than more sophisticated structures. We have also realized that once you develop primary health care, you are emphasizing on mother and child because that is one of the greatest challenges in the health sector. So, our emphasis must be to ensure that at this base, we provide health for all so that we reduce the pressure as we go up the pyramid. That is our focus; that is our vision, with the belief that it is a service needed by everybody, especially the vulnerable. Secondly, it reduces the most complicated issues. In Nasarawa State, we have over 700 primary health care centres and the entire state, which has about 147 wards is networked in such a manner that virtually ward in the state has two, three, four and in some cases, up to five primary health care centres. With that, there is a preponderance of widespread medical services across the state. However, given the number, we feel there has to be some kind of qualitative service also. Apart from providing general services, Nasarawa also has a higher grade of primary health care centre that would serve as a cluster centre, a centre that will coalesce activities within a particular area so that if people go for one medical service and certain things are lacking, just the next door, they will meet these cluster primary health care pilot scheme which has sophistication of activities close to a general hospital, with a laboratory and all kinds of secondary medical services in that particular zone, without having to come to a general hospital. This, we believe, will provide people in the hinterland with quality service next door. It is only when it gets beyond that level they can go to a general hospital at the local government headquarters for attention. This has caught the fancy of the Federal Ministry of Health and they are so excited about it and very soon it will be commissioned, and that is likely going to be something that could be replicated in many states of the federation. You also built a sophisticated school for the physically challenged. What motivated you to embark on that project? Thank you very much. That is another issue that I considered very sensitive, very disturbing and something that every God-fearing leader ought to look into. You see, the issue of people living with disability in this country is a very pathetic one. First, because if you look at the quantum of resources deployed to the governors generally and welfare of the people, you will be amazed at the infinitesimal fraction that is dedicated to serving people with disabilities, even when their number is on the increase by the day because we see disability as just blindness or physical disability. There are a range of disabilities craving for individual care or government support in terms of policy, in terms of deployment of resources to manage these disabilities, but it appears since we don’t have any disability law in the country, such leverage cannot be accessed by people with disabilities. So, their case is a pathetic one; a case of abandonment, a case of unfairness; a case of lack of equal opportunities; a case of discrimination. That is why in the first instance, I am in company with other well-meaning Nigerians to advocate for a disability law. To me, that is most fundamental. Let everyone living with disability know that the government cares, even to the intrinsic issues affecting them. Even if government will not give them all that is there in this world but let government have policy that will kind of take note of the plight of people living with disabilities. That is number one. We have already enacted that one in Nasarawa State and we are working towards a national disability law across the country. I believe that in the coming year when the two chambers of the National Assembly harmonize their bills, people with disability will heave a sigh of relief. The next thing after this fundamental issue of a disability law is also to go to the basics of how to manage disabilities. You cannot do that by dolling out arms to people on the streets begging; that is not how to help a disabled person. I am looking at something that is more fundamental, more structural, more institutional; that was why I decided to build a comprehensive special school for the disabled in Lafia, which has a capacity for over 1,500 students. It is called comprehensive for obvious reasons. It is not just a special school; it is a special school that caters for visual impairment that people call blindness, and hearing impairment that people call, the deaf. A school that cares for people with physical disabilities popularly called cripples, and a school that caters for intellectual disability, what people call autism. So, all these category of disabilities are being taken care of in this special school; that was why I decided to call it Comprehensive Special School. It is also comprehensive in the sense that we will start children from infancy, to get them to know the world around them as disabled people. A blind child of six years old would be taught how to live in the world of the dark because that is his world; so let him embrace that world at the infancy stage, so also the deaf and all other disabilities. At that foundation stage if you have the children to imbibe in the technique of survival, they will have the best in life. That school has kindergarten, nursery, up to senior secondary school where graduates will have opportunities to go to higher institutions. We are trying to do that in such a manner that we work with all the tertiary institutions in Nigeria that offer special education. We are also into partnership with world renowned centres for disabilities rehabilitation in the United States of America like Perkins School for the blind and others. So, the Lafia Comprehensive Special School will be a school that will have a combination of homegrown curriculum and methodology, at the same time in harmony with international best practices as regards disability education. I can’t wait to commission that school and I am happy to say that Mr. President has graciously accepted to commission that school by early next year. Beyond the need to care for the disabled, did you have any personal experience that touched and propelled you to cater for this category of persons? Yes. First of all, it has been part of my propensity while growing up. I was not disabled while growing up; we did not have the misfortune of having any disabled in my family. But it touched me that one is getting all abilities for free, and somebody is out there for no reason, is befallen by such calamity. So right from my young age, I had been wondering what I could do to assist people with disabilities, to give them relief no matter how small. It didn’t occur to me that I was also going to be afflicted by one disability or another. Up to the time I graduated from ABU in 1978, joined politics in 1979, became state youth leader of NPN, state secretary of NRC, went to the Constitutional Assembly and I was just about aspiring for the governorship of the then Plateau State in 1990, when suddenly we had Lassa fever in the family and before I realized it, my first son died instantly; I and my second son became profoundly deaf as a result of the affliction. And ever since then, I’ve been hard of hearing since 1990, but as God would have it, I took it in my stride and felt that was my fate. I was not weighed down but felt it was a challenge. I was lucky to have had my education and gotten married and had children. So, I can fall back on the residual facility I have, and to show people with disability some kind of motivation. That, coupled with my love for people living with disabilities, made me to ensure that I inspire and advocate for them so that they do not feel discouraged. They should be appreciated, given care not necessarily by giving them money, but opportunities. Your Excellency, what is the internal revenue base of your state? When I came on board in 2011, it will shock you to know that the total revenue earnings in the state per month, was N150 million as at 2011 and after all charges plus emoluments involved in handling generation, you find that the state government earned less than N100 million per month. But I am happy to say that as at today, Nasarawa State generates between N500 million to N600 million as internally generated revenue and we are optimistic that the generation will be on the increase yearly. We are projecting that by 2018, our internally generated revenue will hit N1 billion monthly. The optimism is based on empirical evidence because we have expanded activities of our geographic information system for land administration from analogue that I met in 2011 to digital. We now have a land administration system that is at par with that of the Federal Capital territory which pioneered computerized land administration system. Given our closeness to the FCT, we have discovered that Abuja is gradually choking and the opportunities that availed 10, 20 years for people to own land or properties within the FCT is fast becoming a mirage. So, Nasarawa State decided that it should come to the rescue of the FCT by providing a platform where it could be a home to all Nigerians. We have acquired and planned 13, 000 hectares which is about 10 times the size of Gwarimpa, about half the size of Abuja metropolis, just behind Aso Rock. So, we have the potentials; the opportunity not only to salvage the FCT but also create avenue for revenue generation and wonderful development. The 13, 000 hectares have been planned into 29 districts each of which will be between three to five hundred hectares. We are thinking of partnering with the FCT, the Federal Ministry of Housing and also entrepreneurs interested in real estate, to come and let’s develop that corridor. Beyond that, we are also opening the doors of Nasarawa State to serious investors. Olam Farms which is the largest producers of rice has been in Nasarawa State for the past 10 years. But the mother of it all is the commencement of Dangote plantation and sugar refinery that is likely going to be the largest in Africa. The land has already been acquired and activities are ongoing. I can say with all certainty that in the next two years, everything about sugar cannot be done without Nasarawa State. The projection is about 100, 000 hectares but already, Dangote has secured 60, 000 hectares and they are already cultivating and putting the necessary infrastructure in place for commencement. We are single-handedly building the Lafia cargo airport to boost industrial and commercial activities. One of the most contentious issues today is that of incessant clashes between farmers and herdsmen. Benue and some other states are now enacting anti-open grazing laws amidst opposition and confusion. What are your fears over this development? This is a difficult question to answer. It is an issue that I have already made up my mind as the governor of Nasarawa State based on certain undisputed facts. As far as I am concerned in Nasarawa State, anti-grazing law is not necessary, but at the same time, I cannot pontificate or adjudicate over the right of my neighbouring states to embark on such laws. This, to me, is a no-go area as far as their self determination is concerned. But for us in Nasarawa State, I am not thinking about anti-grazing law for so many reasons. One, we are living amicably with the herdsmen because we’ve tried to ensure that all the time-tested synergy and relationship between the farmers and herdsmen were adhered to. Don’t forget that we gracing routes that dated more than 100 years, everywhere up to Kano, Bauchi, Zamfara, Benue and the east. Unfortunately as a result of population explosion, some of these routes were blocked by either farms or certain physical structures. This has been one of the causes of friction between farmers and herdsmen, but as far as we are concerned in Nasarawa State, we’ve been able to ensure that these grazing routes are never blocked, and if for any reason a pastoralist tries to go astray or go to someone’s farm, we have rules and regulations guiding such encroachment and to a large extent, we’ve been able to ensure that our citizens adhere to that. This we’ve done through what we call community based conflict resolution mechanism. It is a template that was conceptualized and implemented in Nasarawa State. That is what has given us peace in Nasarawa State even as we have an appreciable number of farmers and herdsmen in the state, but their activities are being regulated by this community based conflict resolution team which comprises the government, some traditional rulers, farmers and herdsmen. I believe with this kind of mechanism in place, there is no need for creating certain legislation that is likely going to create mutual suspicion and some people can misuse that to create security challenges. That is the second reason. The third is, how do I create anti-grazing law when I have not sat down to first of all have demographic census of the herdsmen I have, if I have to get the quarantined or isolated by having ranches or what have you? I have to know their number and know whether the lands are available. Secondly, I also have to provide for certain things. You don’t put a ranch and it stays there. The kind of local ranching we have, they have to migrate after three months. So, for every herd of cattle, you must have at least four areas where they can move at every season because after three or four months, they will exhaust the green pasture in that area, so they will have to migrate for the area they had previously occupied to regenerate. This is what happens where you have ranches or grazing reserves. You must have fallow areas where they can move to. So you have to get that; if you have to get ranches, where are you going to feed them. I laughed when somebody was telling me about importation of some grasses from Brazil, from wherever. Who will plant the grasses, who will tender them? So these are things that really bother my mind. I know as a fact that cattle-rearing is not business as far as a Fulani is concerned, it is not a commercial activity; it is a way of life. If for instance you give a Fulani man a choice of tripling the market price of his cattle and taking possession of them to stop him from moving around, I can assure you the Fulani man will not take your money; he will rather go with his cattle because if he sells and collects a huge sum, what is he going to do with the money? He is not a businessman and will have to change his way of life all over. Some of these cattle are their patrimony. The men and women have their roles to play in keeping the cattle, the children have their role. So, to quarantine and get them to just focus on commercialization I think, to me, is unfair because it does not conform to their way of life. You are one of the strongest supporters of President Buhari. People have this opinion that Mr. President is a good man, but that some of aides are by their actions painting his administration in bad light and that he will eventually battle to extricate himself from culpability. Is this impression correct? I do not think it is correct; I think otherwise. You see, people have different interpretation of a particular situation. If you have two, three, five people to assess a situation, everyone will assess it the way he or she understands it. But let me say this, I am someone that has known Mr. President for quite some time; I am someone that has related with him politically and very intimately since 2010 till now. I know Mr. President as a very faithful leader; he is faithful to his subordinates. When I say faithful, he adheres to all the tenets of an establishment person. He believes his subordinates are capable of handling issues before them in line with values, his principles and his ideologies. And he does not meddle in their affairs and that is why I say he is a very faithful person. Before he gives you something to do, he must have assured himself that you are trustworthy. He leaves you with your conscience, with your understanding and adherence to his values. So, such a leader is vulnerable. Vulnerable in the sense that he does not go behind you to check what you are doing, whether it is good or bad or listen to gossips as long as what he sees is in tandem with what he expects. So, to say he will find himself in a situation of battling to extricate himself from the culpability, I think, does not arise. The Buhari I know is someone that cannot be faulted when it comes to adherence to values, rules and regulations; he assesses you based on the values. If you are able to discharge some of these values, certain other individual misdemeanors that people are likely going to commit that does not distort or disrupt the smooth operation of governance I think, to a large extent, such could be said to be subjective. Because I know Mr. President is someone who will not spare anybody once it is established that one has faulted. I want to give you a personal experience with Mr. President. When I came on board in 2011, I was the only CPC governor in the whole of the federation. There had never been any CPC before; there had never been former governor of CPC before, there had never been any template, manifesto, constitution or anything of CPC. I was only left with my conscience and the guidance of Muhammadu Buhari who symbolized and personified the ideologies and philosophy that CPC stood for. Being a junior member of his political team, being a governorship candidate or a governor of his own party, being his own flag bearer who is supposed to carry out and put those ideals into practice in governance, I was had the burden of not allowing myself make any mistake; not allowing myself do anything that is personal, that does not conform to the values of CPC. So, for fear that I do not derail, that I do not adulterate or stigmatize those values, I always tried to meet Mr. President, in 2011 up to 2013; even when we were about to have governors meeting, NEC meeting, or anything that has national importance that I had to attend. In my first one year in office, I will go the Mr. President, then General Muhammadu Buhari, to ask him, we have this agenda to discuss; what is your take? Sometimes, he listened and asked me what was my take on the issue; and he gave a nod to it because they conformed, and I did this even beyond 2011. One day, the then General Buhari called me and said your Excellency, you are part and parcel of this think-tank , and from the way you do things, you adhere to the values, to the philosophy, please don’t bother to come and ask me my inputs on issues; I am impressed about your internalization of our values. Please do what you think is right as long as it conforms with the constitution, social justice and fairness to all. From that day, I go to President Buhari to only tell him about the decisions I had taken on any issue and as God would have it, we’ve never had any differences. So, this is the kind of person Mr. President is; he gives you all the opportunity to showcase your intellectual capacity, your sincerity. So, you will agree with me that such a person is vulnerable especially with people who might want to have two faces. Nigeria appears to be sitting on a keg of gunpowder considering the heightening sectional agitations. Of recent, there has been a pronouncement by groups such as the Northern Elders Forum, to the effect that the North is ready for the breakup of Nigeria. Is it safe to say what is happening is a pointer to the end-time for Nigeria? How do fill the prevailing deep gully of bad blood between the North and South? I don’t know what to make of this question because I think there is some kind of generalization. I believe what one might see as mutual disagreement or suspicion between one bloc and another all depends on the angle at which you are looking at it. If you look at it from a different angle, you find that it is a completely different. Let me give you an example to show that Nigerians are united; we consider ourselves as one people with one destiny and also have the patriotism of the country at heart. The answer is the merger and formation of the All Progressives Congress, APC. All kinds of interests you know in this country that are diametrically opposed to one another came and coalesced, to form a united platform that has never been done in the history of this country. When you look at people from the APGA, AG or ACN, ANPP, etc, no accord has been so exhaustive, so broad based, so acceptable of various views and idiosyncrasies like the merger of APC in 2014. I believe that is the watershed in Nigeria’s unity and indivisibility, because if you look at that merger from the North to the South from the East to the West, all parties that were the bastion of certain tendencies all dissolved those tendencies into one Nigerian tendency. The ACN in the Southwest, the ANPP in the Northeast and the Northwest, and the New PDP in the South-south, all came together, including the one and only CPC of Nasarawa State. So in conclusion, I believe that whatever we see as mutual differences or some kind of friction depends on how we look at it, but I am very positive that right from the merger, Nigeria has come to be and the sky will be our limit. But people feel the merger you are referring to was a marriage of convenience that has now developed cracks. There are reports that some elite in the North and some critical stakeholders in the Southwest are not comfortable with Buhari’s government; with what is happening. Do you consider this development as part of the challenges Buhari faces ahead 2019 if he decides to contest? No! I see it differently, my brother. To me, this is the highest level of democratic conformity. We are in a democracy and everybody has the right to self determination, to showcase his own individuality on the same platform that we share. And let me tell you one funny thing; President Muhammed Buhari is a highly democratic person. He is likely to be impressed with the kind of struggle that people are making from different parts of the country. As far as I am concerned, he does not see it as something negative; he sees it as enrichment of democracy and I want to assure you as someone that knows the president well, Mr. President will not accept any endorsement that does not go through the due process of procedures; I can assure you on this. He does not want to get it on a platter of gold; he won’t cherish it. He is someone that is so objective, so committed to the rule of law and due process. If today all of us say no, there would be no primaries, nothing, let President Muhammadu Buhari continue, I can assure you the president will say no, let’s go through the process; if you will not go through the process, I will not like it. What are the major challenges facing the Buhari administration? Nothing much; its only insinuations and lack of appreciation by people in the opposition. What has Buhari not done in these two and a half years? He doesn’t have to go and provide for the kitchen of the 180 million Nigerians. He does not have to interface with every individual and solve all his problems before he is appreciated for what he has done. He has done what is already germane. Let me give you just a few examples. When Mr. President came on board, this country was boiling; from the Northeast with Boko Hara, from the South-south with the Avengers and other militants; to cattle rustling, herders/farmers imbroglio, and certain social upheavals. In so many places across the country, even in Nasarawa, we had the Ombatse crises. That was the picture of uncertainty, of pessimism when Buhari came on board. In fact, the Boko Haram had already overwhelmed the country and was gradually being exported to neighbouring countries –Niger, Chad and Cameroon; that was the picture. Can you say the story is the same today? Nigerians should appreciate this gentleman for what he has done to keep peace. Any government that does not provide peace and security, protection of lives and property, is not worth its salt. That is the most cardinal preoccupation of every government. That alone as far as I am concerned, has given Buhari a pass mark. Secondly, what has bedeviled this country is the tremendous amount of corruption that has pauperized not only the people but even the government to a point where we were becoming bankrupt. And one of the reasons was the kind of indifference, free-for-all kind of attitude that people do with the resources of the country. Our foreign exchange was at its lowest ebb when Mr. President came on board. Can you say the story is the same today? As I speak, our foreign reserve has now hit over 40 billion US dollars. Not only that; those that were squandering the riches are now on the run; the rate at which corruption and squandering of the riches as it used to be in this country has drastically reduced. Also, the issue of Nigeria’s image globally as a belligerent country, a country that didn’t have peace, has now been redressed. Not only that. Look at the N-Power; whatever anybody would says on N-Power, look how much relief it has given to young and aspiring Nigerians that had been unemployed for decades; so many interventions, so many initiatives to carry everybody along. We should not look at those few things that are yet to be done and use it as the basis for judgment; let’s look at how much effort has been made, let’s look at where Nigeria was in May, 2015 when he came in, and look at Nigeria now in two and a half years in terms of security, in terms of corruption, in terms of accountability, in terms of employment, even in terms of physical development. So as far as I am concerned, Mr. President and his team have done wonderfully and I expect Nigerians to appreciate them. I think there couldn’t be a better birthday present to Mr. President than our commitment as Nigerians to support all his initiatives to correct the ills that have bedeviled this country.